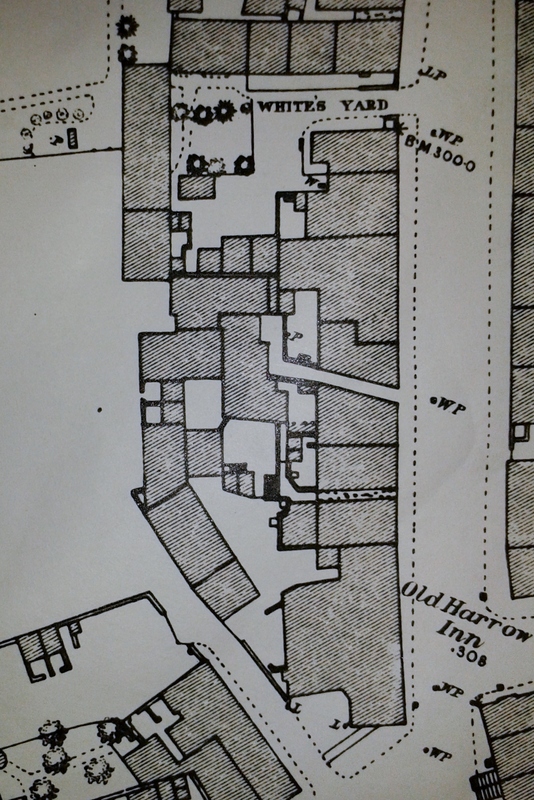 Just after the Old Harrow Inn, in 1860 the first house was occupied by master cooper Thomas Stanesby, who remained there until about 1865, before moving to Derby .. tailor and woollen draper William Manners then moved in and stayed until about 1882 before moving to alternative premises in Bath Street. At this point Adeline’s letters describe the next house as occupied by tailor James Turton, followed by William Rose. The census and trade directories indicate that it was perhaps the other way round … which is the order I have adopted. Mr. Rose had the next as a shoe shop. He was also a rate collector. We are now opposite the first offices of the Pioneer newspaper. William Rose, a son of William, officer of excise (tax collector), and Sarah (nee Robinson) and born in Wirksworth in May 1817, was in 1834 an apprentice to Matthew Hobson, grocer and draper of Market Place. Five years later he went to Manchester to trade as a grocer and there he married Mary Ann Walker, daughter of Paul, shoemaker of Market Place, and Eliza (nee Varley) in February 1843. Their daughter Eliza was born in that city in 1844 before the family returned to Ilkeston where son Thomas Robinson Rose was born in June 1846. Puzzle alert! William appears on the 1841 census at Hardman Street in Manchester, occupation grocer. He is with Sarah who may be his first wife. On his return to Ilkeston, William traded as a shoemaker in East Street and then in Bath Street, but took out a licence as an auctioneer in 1857 and is recorded as such in the 1861 census. In October 1867 he became the Collector of Poor Law Rates for the Parish of Ilkeston after the resignation of Richard Vickerstaff, moved to live in Nottingham Road in the early 1870’s and in the mid 1880’s went to Ivy House at 12 Graham Street. Mary Ann Rose died in March 1894 at Graham Street and was followed by husband William barely one month later, just three days before his 77th birthday. He had one daughter married to Mr. Phillips, who was away in India. They had one little girl. Their daughter Eliza married Francis Phillips in February 1865 and Adeline recalls ‘one little girl’ — their daughter Mary Ann Rosa. Gap alert! Why and when was Francis ‘away in India’? On the 1871 census Eliza is living at Bath Street with her parents and her daughter Mary Ann Rosa born in 1866. There were at least two other Phillips children, William Rose (1872) and Thomas Rose (1874). In November 1887 Mary Ann Rosa Phillips married draper’s assistant Harry Simpson. Son of William and Mary Ann, Thomas Robinson Rose married Susannah Chadwick, daughter of James, grocer and ironmonger of Bath Street, and Ann (nee Brentnall) in November 1865. After the births of their children William George Hickton, Amelia Florence and Florence Gertrude, the family left Ilkeston in the early 1870’s and eventually arrived at Hove, Sussex, where Thomas Robinson practiced as a surveyor. They later returned to live with Thomas’s parents in Graham Street. Susannah died there – at number 12 – in October 1908, aged 62. By 1874 William and his family had left Bath Street and these premises were then taken by Samuel Fretwell, younger brother of blacksmith Job Fretwell of South Street. Samuel was still there in 1881 but moved out shortly after this. Returning down Bath Street on the West side, was Mr. Turton’s tailor’s shop. This shop belonged to James Turton, son of tailor Samuel and his first wife Frances (nee Pollard), of Anchor Row and later Pimlico. He married Hannah Fletcher, the daughter of Nottingham livery stable keeper and cab driver William Daniel Fletcher and Elizabeth (nee Holland?) in March 1858 and the 1861 census shows the couple at West’s Yard by the Market Inn with one-year old son Daniel Fletcher Turton. However the family was soon established at the top of Bath Street and remained there up to and after the death of James — from cirrhosis in May 1882, aged 46. At the end of the century his widow Hannah was living with her youngest child Tom Fletcher Turton in Salford, Lancashire, while another son — James junior — was now trading as a hairdresser at the Bath Street home. The next private house was above Mr. Solomon Beardsley’s baker’s shop. Mr. and Mrs. William Fritchley lived in it. Mr. Fritchley was a joiner, who left a widow and one son. We met the parents of joiner William Fritchley in New Street. He was one of at least 11 children of Cossall-born farmer and butcher William senior and Ann (nee Dodson), and married Sarah Jane Bennett, daughter of John and Maria of the White Swan Inn in Spondon, in March 1853. In that same year their son Frederick John was born, followed by Thomas Henry eight years later and then William Dodson in the following year. When William died in Bath Street in December 1866 ‘after a long and severe illness’ the family left Ilkeston to settle eventually at 25 Crompton Street in Derby and remained there into the next century. Which brings us to Solomon Beardsley’s baker’s shop. The Grand Tour.